People! Stop eating crap salads and eat yummy sausages! Chop't next door had a line out the door while this place had ample seating - figures. 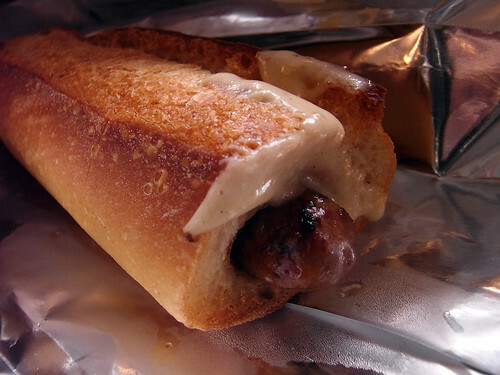 Dogmatic - a "gourmet sausage system" inserts your choice of handcrafted sausage and sauce into a warm crispy baguette. I haven't had one of these since Chamonix in the 9o's, apres-ski style. The food, the vibe and decor is just teeming with fun-ness! On my way back from a pre-lunch meeting, and on her way to a post-lunch meeting; Union Square was the perfect junction spot today. And what a fun lunch it was. mmmm sausage! their website is super fun too!